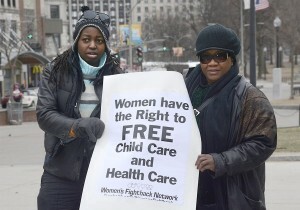 Women demand rights, March 26. 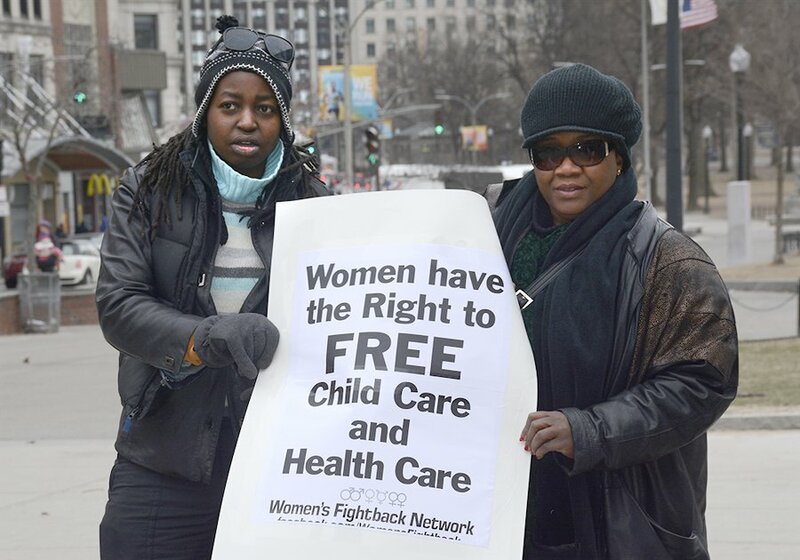 Boston — Despite temperatures hovering around freezing and 50-mile-per-hour wind gusts, the Women’s Fightback Network commemorated International Working Women’s Month with a militant march and street rally on March 26. From a speakout at the Park Street transit station, participants marched right through the doors of a nearby McDonald’s restaurant. They chanted, “What’s outrageous? McDonald’s wages!” among other slogans defending low-wage workers and calling for raising the minimum wage in Massachusetts. They also stopped at a military recruitment station to demand an end to U.S. wars of aggression. Then the march went through what is known as Downtown Crossing, where a few affordable shops used to be, but which are now being replaced with more expensive ones. This area is experiencing increased gentrification as is happening in other areas of the city. Outside the Boston School Committee. The marchers then went to the location where the Boston School Committee was voting for cutbacks by kicking 4,500 6th, 7th and 8th grade students off school buses and on to city buses. 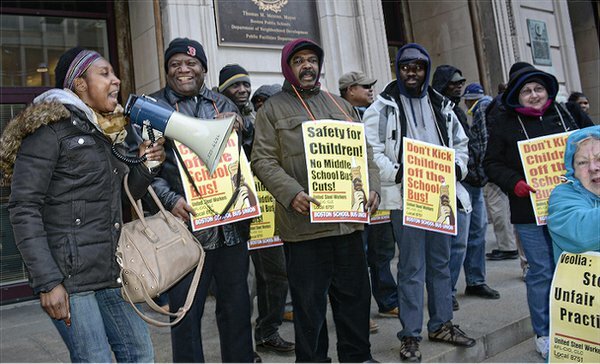 There they joined with close to 200 members of USW 8751 Boston School Bus Drivers Union, the Coalition for Equal Quality Education and others to protest the austerity cuts. 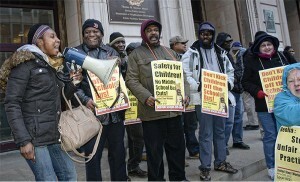 Activists raised many concerns about safety for their children and their access to public education, but the committee voted unanimously to approve the cuts. One outraged parent shouted “Shame on every one of you!” as she stormed out. The racist cuts impact the Black and Latino/a communities most severely, and are part of the ongoing resegregation of Boston schools.